The Monthly Newsletter Promotion is back again! We have the best customers, and wanted to show our thanks with an exclusive offer. For the rest of April, mention this email and anytime you spend $50, we’ll take $15 off your bill. Spend $100, we’ll take $30 off – you get the idea. 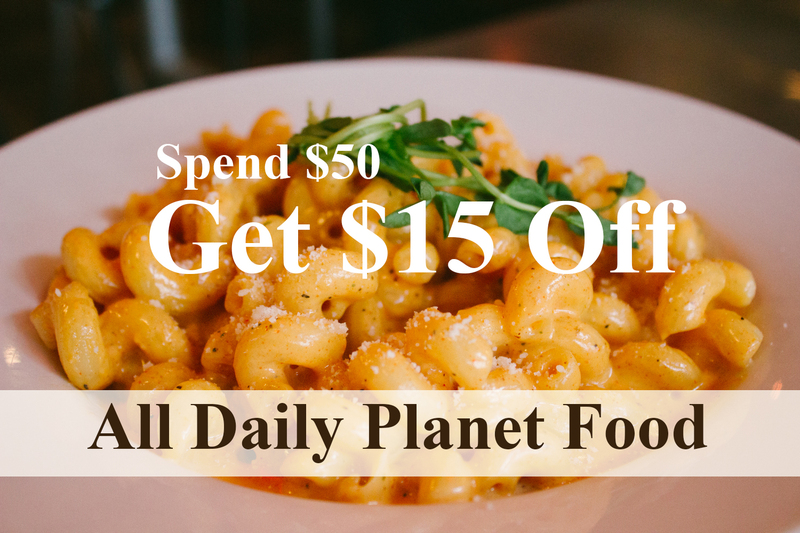 Come enjoy your favorite Planet dishes and check out our new menu additions. Live music, amazing ambiance, and delicious food – we can’t wait to see you! Keep an eye out for our May Newsletter coming soon with new promotions, specials and more. Not valid with any other promotions or specials. Offer ends 4/30/15. Thanks for giving me a heads-up on this great deal! Would love to take advantage of it. Love the planet and love the newsletter! FABULOUS! We LOVE this place sooo much. Consistently fabulous food, and the wait staff is second to none. It’s like they must have their own school of Daily Planet training to be the best wait staff out there. Can’t wait to go again! And let’s not forget the desserts! OMG people, try the Elvis!